Why Do I Need An Orthodontist? 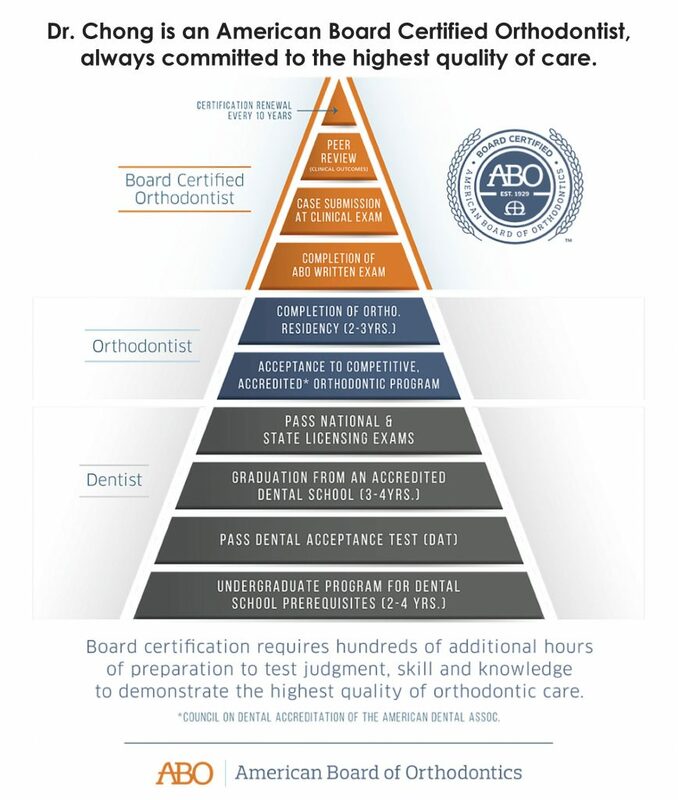 And What About A Board Certified Orthodontist? A beautiful smile is the outward sign of successful orthodontic treatment; there is, however, a lot more to getting there than you might think! Orthodontic treatment is complex biological process. It involves changes in jaw bones, facial bones and soft tissue as teeth are moved into their new positions. Orthodontists master the multi-faceted intricacies of orthodontic treatment during their two to three-year residencies in accredited orthodontic programs so that they can help patients develop healthy, beautiful smiles. Because the very foundations of the face and mouth are at stake, it is vital that patients see an orthodontist regularly throughout their treatment. Orthodontic treatment is not a quick fix. Your care starts with a thorough examination of the teeth and mouth, and study of dental records such as x-rays, photos and models of the teeth. From this detailed information Dr Chong develops a custom treatment plan. You will be advised of the recommended treatment, how long it is expected to last, and steps your must take as a patient, such as keeping scheduled appointments, to reach treatment goals. Because orthodontic treatment is such a complex process, even the most carefully planned treatments should be monitored regularly to ensure treatment is on course. If anything is amiss, a regularly-scheduled visit gives the orthodontist the opportunity to appropriately intervene in a timely manner. Appointments are scheduled roughly every six-to-ten weeks to assess tooth movement and oral health, and to adjust your treatment as needed. Working together with Dr Chong, an American Board Certified Orthodontist (Why Choose a Board Certified Orthodontist*), orthodontic treatment can yield life-enhancing results: better function (biting, chewing, speaking), improved appearance and increased self-esteem. Our advice: keep your scheduled appointments, advise Dr Chong of problems that may crop up between appointments, watch what you eat and drink, avoid sugary drinks (soda, sports drinks and sweet tea) and brush and floss as instructed by Dr Chong and her team. It’s worth the effort to reach the goal you and Dr Chong share: giving you a healthy, beautiful smile that will last a lifetime.